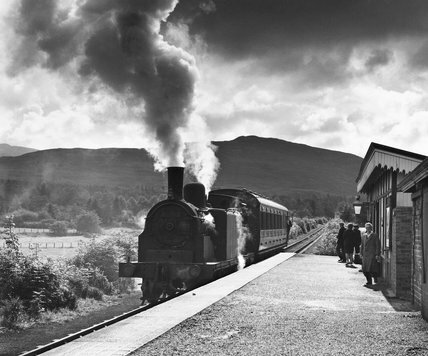 Steam locomotive at Killin Station on the Oban line, September 1961. Class 2P 0-4-4T o 55173 at Killin with the branch train from Killin Junction. Photograph by Colin T Gifford. Merchant Navy clas 4-6-2 No 35011 steam locomotive, 14 September 1964. Merchant Navy Clas 4-6-2 No 35018 'British India Line'. 'Firth of Clyde' locomotive, 11 November 1964. 'The Elizabethan', Edinburgh, 8 September 1961. An expres leaving Victoria Station, Nottingham, 2 February 1963. Steam locomotives in the Stafford Road shed, Wolverhampton, 8 October 1961. 'Raglan Castle' steam locomotive, Paddington Station, 11 November 1957.